My doughnut tour of Portland concludes with 2 mini-doughnuts (Marisa ate the other two) from Pip's Original Doughnuts & Chai. 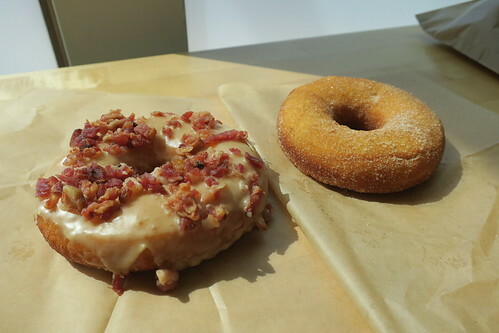 I ordered the candied bacon doughnut and the cinnamon sugar. They were tasty (and hot! Part of their deal is that the doughnuts are fresh to order) and I liked that they were only a couple bites each. I still think that VooDoo is my favorite, though I like the aesthetic of Pip's. Though boo to them for not having the tshirt I wanted in XXL. Come on! Tor.com has always been a favorite of mine, and when they started publishing novellas I bought a few. I didn't read any, since I'm a very busy man and all, but I bought them and that has got to count for something! I finally decided to read All Systems Red, and on one hand I wish I had read it sooner but then again if I had the wait for the second novella would be even longer. The main character calls itself Murderbot, but I don't want to talk too much about it since that might give away some things that are better off discovered while reading. I will say that Wells manages to paint a very comprehensive world in less than 200 pages. I know there's lots more to discover in this universe and I hope that she is working on a full raft of books! The ebook is super cheap, and it isn't a big commitment of time so just read it already. Who should read it: If you like introspective robots, this is the book for you! Would I read it again: Sure! Though I'd rather read the next one. Simon R. Green writes several series and Ghost Finders is my least favorite. I only pick them up if I find them for cheap in used bookstores which is why I just read “Ghost of a Dream.” I paid $2. That might have been too much. This isn't a good book, though it is a quick read. Why isn't it good? Well, in it we follow the adventures of a ghost finding team. The one thing, we are told, these people are very good at is knowing if something is a ghost or not. In the first part of the novel, which is totally unrelated to the rest of the book, the characters meet someone who turns out to be a ghost, but hid it from them. This is treated as a big deal since it can't ever happen. Then it proceeds to happen at least two more times in the book. Ug. And that's just one example of why you shouldn't read this book. Plus, in the book one of the characters always wears a white suit and sunglasses. The cover features three people, who I can only assume are the three ghost finders we follow in the book, and none of them are wearing a white suit OR sunglasses. Sheesh. Who should read it: No one. Would I read it again: No. My go to, pictured above, is the Maple Bacon Bar. As I said to Marisa: the Blue Star is better but I like the Voodoo doughnut more. It just tastes like what I want a doughnut to taste like… and I feel like Blue Star is just a touch pretentious. Of course, if I could only go to one doughnut place in the world neither of the Portland options would make the cut. I would save that honor for NYC's Doughnut Plant. But I don't want to live in a world where I can only go to one doughnut place. When you're in Portland, well at least when I'm in Portland, that means it is donut time! Marisa prefers Blue Star to other famous Portlandian donuts, and so we made our way to Blue Star to have a couple of donuts. I opted for the Maple Bacon, and Marisa wanted a blueberry burbon donut (yeast, not cake! ), but the last one was sold to the guy right in front of us (though he did offer to give it to Marisa, she declined). Marisa settled for a vanilla cinnamon cardamom donut (and even scored a free orange donut to help soften the disappointment of not getting the one she wanted). Vacations are for reading mysteries! Missing, Presumed is a modern day (well, set in 2011) police procedural; a genre that I typically eschew. I generally look for reading material that takes me away from the real world, not stories which highlight real world problems (I get enough of that watching the news, am I right?). That being said, this book is set in England which is far enough removed from my daily existence that I could enjoy it (you won't find me reading any of the many, many NY/LA based police mysteries!). Manon Bradshaw, the main character, is a 39 year old woman working for the Cambridgeshire police force and assigned to a high profile missing person case. It looks like foul play was involved, and to make things even more complicated the missing person is the scion of a physician to the Royal Family. Add in a motley assortment of characters, a handsome boyfriend, and a corpse and you've got yourself a fine mystery. Each chapter of the book switches from character to character, which works well to paint the complicated picture of the case and Manon's life. That's what makes this book so interesting to me: the mystery is a good hook but I really wanted to learn more about Manon and her life. Good thing this is the first in a series! I'll certainly be reading the next book (I almost bought it the other day, but it is only about 300 pages and the hardcover cost $27. I'll probably get it the from library and then write about it!). Who should read it: Fans complex characters trying to do their jobs. Would I read it again: I'll read the next one! Seaside, Oregon isn't my favorite Oregon coast town. It feels to me what I imagine the Jersey Shore feels like, though to be fair I've never “gone down the shore,” as they say in Philadelphia. It is a town populated with arcades, souvenir shops, and family friendly restaurants. Not really a place I would opt to go on my own, but Marisa has spent many a happy hour at Seaside with her family so there we stopped. Plus my nephews had fun at the arcade, so who am I to judge? Luckily for me, there's a bookstore called Beach Books and I was able to spend a few minutes, and dollars, there. The bookstore itself is yet another typical beach bookstore: lots of fiction (with an emphasis on mysteries) and not too much else (Marisa found their cookbook section to be lacking). 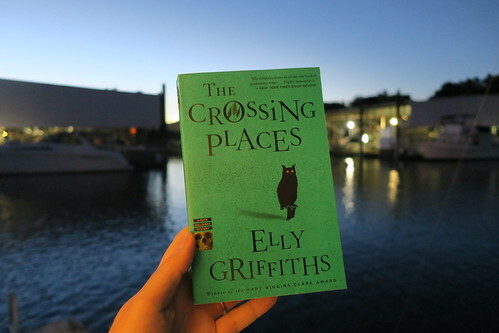 I did pick up “The Crossing Places” by Elly Griffiths. I read “The Zig Zag Girl” by the same author last year on a lark without knowing she had written a long lived series. Based on my enjoyment of the book of hers I had read I bought this one, which is the first in her series (and was recommended by an employee at the book shop). 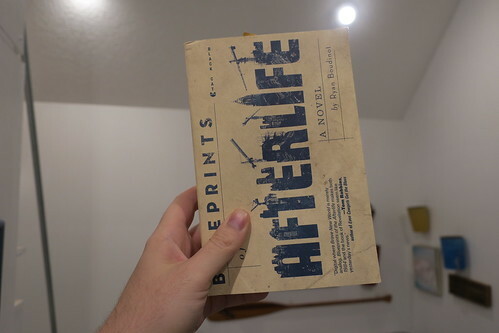 The second book purchased on vacation is a brand new copy of “Blueprints of the Afterlife” by Ryan Boudinot (the cover of which assures you that is it, in fact, a novel). Why this book? Well, I've looked at it countless times and I thought I should give it a whirl. I picked this up from the Cloud & Leaf Bookstore in Manzanita, Oregon which is a lovely little beach town bookstore. Not much science fiction (boo), but lots of non-fiction, mysteries, and things that you'd read on the beach. Oh, and if you're in Manzanita and are craving Mexican food I can highly recommend El Trio Loco 2. I'm on vacation, and you know what that means: I buy books! The first two books were purchased at the Goodwill in Tillamook, Oregon. I don't expect the Simon R. Green book to be good, but I enjoy reading his stuff and it cost $2. The Pratchett will go on my pile of to be read Pratchett (I've read some of his stuff, but not enough!). Another day, another mystery! Though I tend to think that a book qualifies as a mystery only if it is possible for the reader to figure out the answer before the main character. Given my definition, I suppose “Celine” by Peter Heller isn't a mystery at all (though I guess a reader smarter than me could have figured it out which would make it a mystery again!) but it is a compelling novel just like it says on the cover [A little aside here: Why are publishers increasingly feeling the need to put “a novel” on book covers? My pal Dan Moren wrote a book recently on which the cover helpfully assures you it is a novel. Just in case you confused it for a… parrot? I don't get it. Anyway, read Dan's book. You'll like it! I did. And look, a bonus book recommendation within the text of another recommendation. Aren't you the luckiest blog reader in the world?]. Celine, the main character, is a lot of fun and one of those detectives you jus know you'd enjoy following around all the time. I'm hopeful that this is the start of a series, but given that Heller seems to be shooting for literary stand alone books I imagine this will be Celine's only adventure that we get to read. Heller is a talented author whose work I have enjoyed previously, and I didn't even realize he had written this until I started reading it and his bio mentioned that he had written “The Dog Star.” Both share his spare prose style, with occasional eruptions of words to describe mostly natural settings (which makes sense given Heller is an adventure/outdoorsy writer), and memorable characters. I did enjoy The Dog Star more because it seemed fresher, which is tough to do in the post apocalyptic genre. Celine is certainly a fresh-ish take on the detective, which is a feat unto itself! Who should read it: People who are looking for a well written book featuring an older female main character who is quite handy with a gun. Would I read it again: I would read another book featuring Celine in a second! K.J. Parker is one of my favorite writers, which is odd because they don't exist. Well, I mean they do but that's not their name. K.J. Parker is the pen name of Tom Holt, another author, when he feels like writing fantasy (though this isn't high fantasy, so no magic here. Low fantasy, I suppose, is the term though it more often feel like alternate history without having to worry about actual history). I like K.J. Parker so much, in fact, that I have purposefully not read several of his novels. Why? Just so I won't find myself in the position of having read everything has has written thus far. The funny thing is, I have a hard time getting into Tim Holt novels but I drink up Parker novels like delicious Diet Cherry Vanilla Dr. Pepper. Imagine my surprise, and glee, when I found out that there was a new novella out (found via the New York Times Book section, of course). I immediately hastened to Amazon and bought it. And I have just devoured it on my flight to Portland, Oregon (the same flight on which I finished reading Amatka). It is a short book following a typical Parker character: someone involved in the ruling class, good at his job but doesn't want to be, and thrust into lots of intrigue. The book also features another of Parker's favorite things: long lists. Lists of fictional books, lists of fictional provinces, and lists of supplies. I loved it all, and it doesn't hurt that the central mystery (if you can really call it that, since it is pretty incidental to the story) revolves around monks who love books (as does the main character). Who should read it: I'm always hesitant to actually recommend Parker's books to people because I think they are to a very specific taste, and there's nothing worse than telling someone to read a book you really liked only to find out that they didn't enjoy it. Therefore, you shouldn't read this book. Would I read it again: I would, but that would be very silly since I still have so much unread Parker left to enjoy! VanderMeer's work combines a high concept story idea with what can only be described as “writerly writing.” Some people love it (i.e. me), and others not so much. Tidbeck takes a super high concept idea, what if people went to a strange place where you had to constantly name things to keep them from dissolving, and bolts on a very personal story about a woman trying to adjust to life in a new place, meeting a partner she never thought she could, and questioning the very foundations of her society. I was doubtful about how long Tidbeck could make her core concept work. There's only so many times I want to read about someone calling a pencil a pencil so it doesn't turn into goop, but she did a masterful job of quickly building this strange little world and populating it with very real, and believable, characters. Who should read it: People who love high concept worlds populated by very relatable characters. Would I read it again: I would, which is saying something since I don't normally re-read things. I'm certainly going to be reading her next book (whatever it is!). I have a thing about eyes. Just the thought of touching my eye completely grosses me out. This is why I have never bothered with contacts (plus I think I look good in glasses). And now that I've read this story about doctors finding 27 (!) contact lens in a woman's eye during surgery I never will! I mean… how does that even happen? Why is it, and I can only assume here, slight chilly where ever the cybersport is happening, thereby requiring a light sweatshirt? Does the "comfortable, natural range of motion afforded" by the "articulated sleeves" mean this was designed specifically to allow for typing whilst wearing? Are most other sweatshirts not appropriate typing attire? Blue (well, "buccaneer blue") and gray (or "iced slate") are the only color choices for the big and tall variety but the regular sizes get an additional choice: rhumba (which I think is red). Do you believe your big and tall customers are all cybersport obsessed Civil War enthusiasts? The old one is very nostalgic for me, but the new one is much nicer I think. I was going to start this review by admitting that I had no idea how I came to be aware of this book, but I'm pretty sure I can blame this article in the The NY Times. You see, dear reader, I've developed this habit of reading about new books, and if I'm intrigued enough I search my library's website to see if they have it. Generally, since I live in a big city, the library has it. However, since I live in a big city, there are often several people ahead of me in virtual line for the book. I put the book on hold and promptly forget about it until the library emails me to pick up the book. And that's how I ended up reading Wolf on a String. I figured it would be a mystery set in a historic period, and it is… kind of. The mystery really isn't the point of the book though there are a several dead bodies, and you do find out why they all died at the end of the book (in the last 20 pages or so). The revelation seems perfunctory; mandated by the book's genre, not by the author's story. You see, this is a sort of story book set in the court of Rudolf II, Holy Roman Emperor. The main character, Christian Stern, suffers an improbable rise in society and is saddled with the task of solving a murder. A task which he spends roughly 90% of the book avoiding as well as he can. Instead the reader is treated to multiple diversions with some memorable characters. And some darn good writing. The one thing missing from this book is the sort of train track plotting that most mysteries deploy, but I didn't miss it because I was enjoying the writing. Benjamin Black, it turns out, is the pen name of John Banville. Don't worry if you've never heard of him, because I hadn't. He is, so it would seem, the winner of a little thing called the Man Booker Prize which is much coveted writerly award. This dude can write, and if you like Writing (notice the caps there) then you'll probably enjoy this book. Who should read it: Someone looking for literary fiction with a slight coating of mystery. Would I read it again: Nope, but I will check out some of his other work. Alan Alda is well known for his acting career, but the first thing that comes to my mind when I hear his name isn't M*A*S*H but Scientific American Frontiers. He hosted that show for something like 11 years and feed the flames of his passion for communicating science to general audiences. It certainly worked for me, though I knew in high school that I'd never really be a scientist. I took physics in my senior year of high school, as you do, and I wasn't a bad student but I never did particularly well on the tests. Then one day I missed a test due to illness, so she had me do a make up test after school the next day. However, she didn't give me the same test, rather I had to explain the various theories that were covered on the test instead of solving math equations. I aced it. Would that I were more perceptive person, dear reader, for it would have been at that moment in which I would have figured out the course of the rest of my life. Instead I went off to college and decided to major in physics. That lasted about one semester, after which my lack of higher math skills was confirmed. Again. It took me several years to figure out that communicating complicated ideas is my strong suit, though I am by no means an expert on this practice (but I keep trying!). Which leads me to this book. I was aware of Alda's work with scientists to teach them effective communication skills, and since I communicate technical issues to non-technical audiences for a living I figured I could learn a thing or two from this book. The book itself is as charming as you would expect for a book written by a man who makes a living being charming. Alda wraps stories around all of his lessons (don't call them “tips,” he's not a fan of tips) which grounds them in reality (and proves that his methods are effective since he extols the virtue of storytelling throughout the book). Empathy - Try to get into the mindset of the people you're communicating with. Storytelling - Don't start with the facts, lure people in with a story and then slip in the things you want them to know. Improv - This is mostly a tool to learn the first two things. Alda uses the 200ish pages of his book to illustrate these points with interviews with scientists, a little bit of research, and a heaping helping of anecdotes (I particularly liked the thing he does with a glass of water and an audience member). Now, I should point out that I rarely read non-fiction and even more rarely read memoirs of which this sorta kinda is. The reason? I always bristle at the tendency of people to make themselves the heroes of their own stories. Alda does a little bit of this, but his charm and clear language managed to overcome my dislike for this trope. Who should read it: Anyone who wants to think about how to communicate their ideas with others. Fans of Alan Alda. Would I read it again: Probably not, but I will think about some of the things he mentions when I writing for an audience.